Sometimes unfortunate circumstances unexpectedly lead to fortunate circumstances. This happened recently when my entire weekend planning on Saturday morning at 5 am spontaneously got cancelled and I didn’t know what to do with my weekend which I had so much looked forward to. Instead moping I decided quickly to go to Paris as it was only 1:15 hours away. After a day of strolling, looking and discovering I ran into a bar in the early evening, which was recommended to me from a reliable source. While the inside of the bar still seemed to be empty the staff called me to come in with a radiant smile. 5 minutes later, the first glass of wine stood at the center of the bar, so i just placed myself in the center of action. “Freddy’s” is a small wine bar in Saint-Germain-des-Prés, the wonderfully colorful artists quarter of Paris. People wander through lively streets where cafés, restaurants, boutiques and shops are crowded but somehow still quite nonchalant, stylish and well placed. Freddy’s is quite a tiny place, if I hadn’t look at the house number, I would have probably walked past it without noticing. 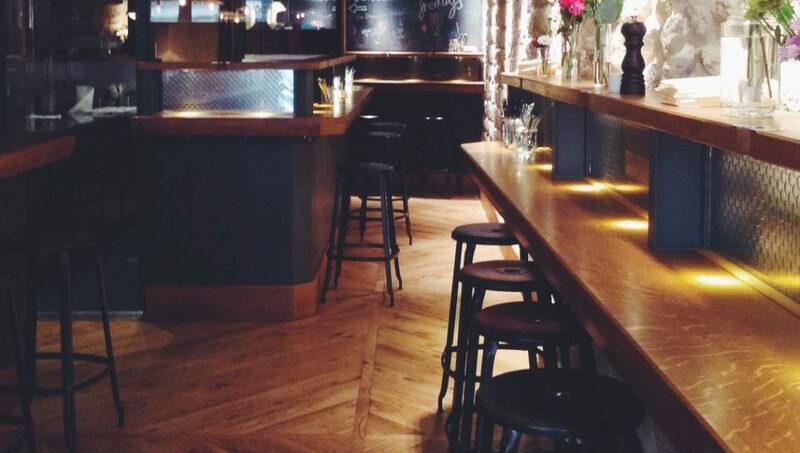 There are no classic tables, but only bar counters with stools. 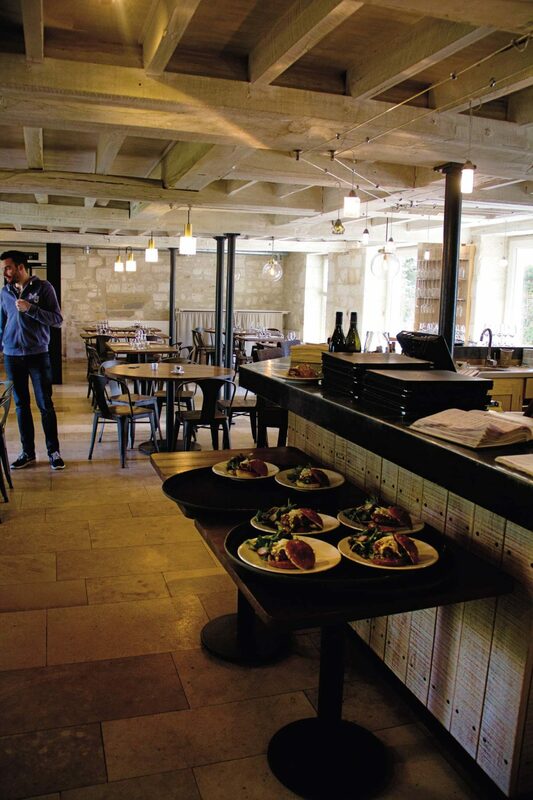 It’s more like a bar than a restaurant, even if there’s food on the menu, much more than olives and bread. Tapas bars from abroad seem to be the role model for this gastronomic concept. The menu is a quite quickly detectable matter: two sides of wines and one side of dishes. Colored letters on the walls command “Drink French!” and I don’t hesitate one second to follow. “Only french beverages find their way into the glasses here while there are exceptions for food”, explains the bartender. Wines and sparkling wines are on the list, as well as a few artisanal cidres, beers and even grape must. My first order was quick: an intensely pink sparkling wine, the “Rosé à lies” Vin de Table of Domaine Jousset from the Loire valley. A blend of 50% Gamay and Grolleau 50%. That funky blend alone peaked my interest. On the nose the wine seemed to be cool and quite capped. Robust fruit notes, yeast in addition. The medium-high acid came as a surprise as I took the first sip. Straight-forward tannins interfered with the bubbles for a short surprise second before the wine and I became friends. The food section of the menu is french with a few spanish as well as italian details. Fantastic bread is freshly cut for each guest – so good that I wanted to buy a loaf. Cold french tapas tempt to snack your way through the evening, from pork rillettes in the mason jar with house preserved gherkins and pearl onions to Beaufort with tomato confit, freshly cut on the beautiful traditional machine, or refreshing melon ceviche. Slightly unripe, green notes hit my nose. It must have been a slightly cool or rainy vintage that found its way into the bottle. Rich in body and mouthfeel, rustic on the palate, with notes of slightly unripe raspberry redcurrant and a wild hint of red fruit chewing gum the wine somehow reminds me of austrian Uhudler or red Schilcher wines if anyone knows what I’m talking about. With its mineral character on one side – it is grown on silex soils – and the fruity characteristics on the other, it covers interesting ground. A pleasure to discover but in my opinion too overwhelming to drink a whole bottle. Gladly the cook arrives at 6 pm, right before I order every single cold snack I can get my eyes on, and finally heats up the grill. The warm dishes service starts now. 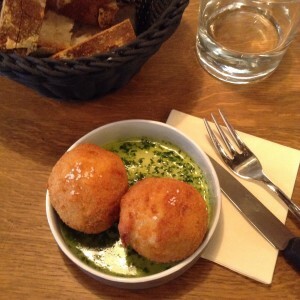 I order Arancini aux Escargots, as an appetizer, crispy fried rice balls filled with a juicy soft snail in herbed butter on the inside. The rice has a creamy texture and a very aromatic cheese flavor. It reminds me of fried risotto and I really like the union between the rice and the french snails. And look, my perception of the sparkling wine and its roughness changes immediately as I enjoy it with the arancini. The fat of the cheese and the earthy taste of snails add almost perfectly to the slight tannin structure and the refreshing sparkle. A good match, another surprise on this evening. 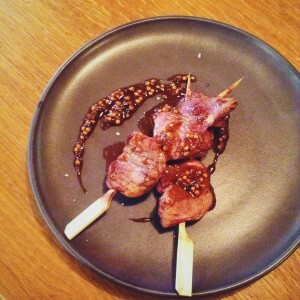 Shortly after I can’t prevent myself from ordering grilled duck heart sticks in a sherry vinegar mustard grain dressing. Fantastic stuff that asks for good company. So I order a red Saumur „Hanami“ 2014 from Domaine Bobinet. 100% Cabernet, 6 Euro a glass. Cabernet Franc, normallly a bit too rustic for my personal taste, matches these slightly sour and spicy duck hearts astonishingly well. Wet tobacco and earthy notes come out of my glass. Medium-high acid with subtle petrol notes mark the first taste I get of it, it seems to be tight and closed. Meaty tannins, grill flavors, slightly burnt wheels. After a minute it shows artificial cherry notes, brett, a few green notes linger behind and give a cool impression even though a few spice notes hide in the background. It still seems to be bouncing between spicy & roasted and therefore matches well with the dressing of the food. 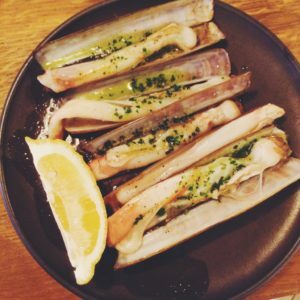 As a last snack of the day I receive a plate full of razor clams in garlic & parsley butter which I pair with a Savennières „La Roche aux Moines“ 2012 from Château Pierre Brise at 9,70 Euro the glass – Chenin Blanc as I love it but to be honest not the best friend to the garlic butter, so I quickly reorder a Vire-Clessé 2013 of Les Héritiers du Comte Lafon for 11,60 Euro which works way better with the delicious razor clams and shines the light for the aromatic shellfish. Ready for a very happy end to a day that started quit unhappily, I spoil myself with a final sip of Jurançon „Bi de Casau“ 2011 of Domaine Guirardel before I head out Freddys wine bar into the night. There is no doubt I will come back to this uncomplicated wine place with friendly bartenders and many tastes to discover. If you want to go discovering, too, make sure you don’t show up too late, as Freddy’s does not accept reservations. First come, first poured.